Bone Shaker was a Super Nova thrill ride manufactured by Mondial. It was originally sited in Festival Park, behind what is now the Corkscrew On-Ride Photo booth, and was called Energizer. With the creation of the X-Sector in 1998, Energizer was relocated into X-Sector, and also given a paint job, of silver and black to make it fit in with the colour scheme. It stayed here until the end of 2000, when it was again moved back into Ug Land, the new Festival park. Again, the ride was repainted, which made it look better than it ever had before, with the supports painted blue, and a large bone forming the top support of the gondola. The ride itself was a long gondola, supported by two large arms. These arms could rotate independently of each other, thus allowing the ride to move in pretty much any direction, and creating a slight feeling of weightlessness. Standard lap restraints were used to stop you being thrown around too much. The ride program varied, and sometimes it could be quite a thrilling ride, but other times it could be pretty tame. It was said that Bone Shaker became even less of a thrill ride in 2001, with ride programs being slower and less intense than ever before. 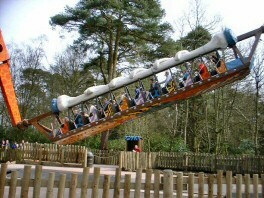 The ride had a major gearbox fault at the end of 2003, which stopped it from working. It sat, closed off, in its Ug Land home until late 2004 when it was moved to an area by the flag tower, to accommodate the construction of Rita. It was finally removed from the site in June 2005, and sold back to Mondial.